Another quirk that needs to be explained, why only 4 buses instead of 7 are showing: When a driver logs into AVAS manually, the destination sign will show correctly and the announcements will be made correctly, but the bus will not show on WebWatch, since there is no schedule associated with that bus. So you have a "ghost". Now the bus nowhere near 410 showing as a 410 on WebWatch is best explained by an error in programming. This location would be on 411, correct? Well, then what has happened is when the schedule was built, somebody erroneously put in route 410 as the route number instead of 411. It might be making correct announcements and have a correct sign, but if the part of the programming that has the route number (not the description - that is a different subroutine), the bus is showing where it actually is, but WebWatch thinks its a 411. AVAS has a whole slew of subroutines working all the time. If one goes sour, all sorts of weird things happen, up to and including showing a bogus bus number! 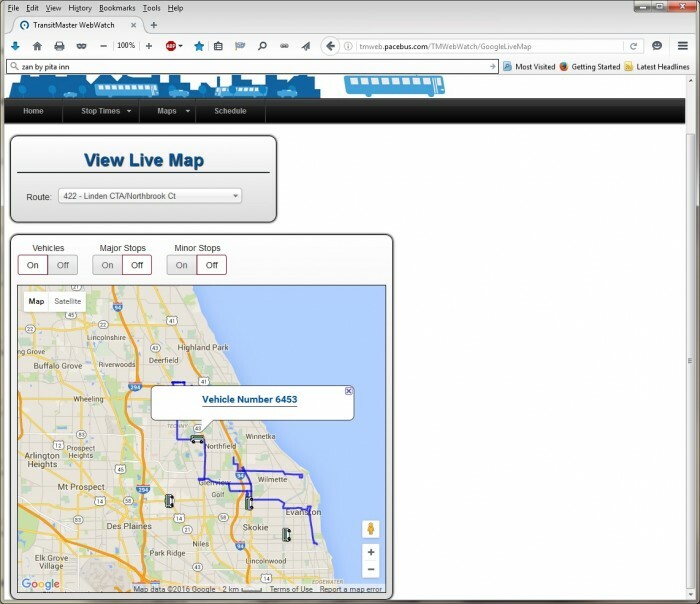 It might be making correct announcements and have a correct sign, but if the part of the programming that has the route number (not the description - that is a different subroutine), the bus is showing where it actually is, but WebWatch thinks its a 411. Since 410s and 411s swap at both Golf Mill and Village Xing, that can't be the explanation. It isn't like the old 411 or current 354 which keeps its number even though a circulator. Some 410 didn't swap to 411 at Golf Mill (or a couple of blocks past it). BTW, the next mystery is why there is usually a NW EZ Rider sitting in the Golf Mill waiting area at about 9:45 p.m. flashing 422 Old Orchard/Glenview/Northbrook Court, while the last bus to Northbrook Court is at that time there flashing (properly) 422 Evanston/Davis CTA/via Route 208. From the schedules and observations, it sure doesn't look like a 270 or 272/ Maybe I'll try to track that down next week. 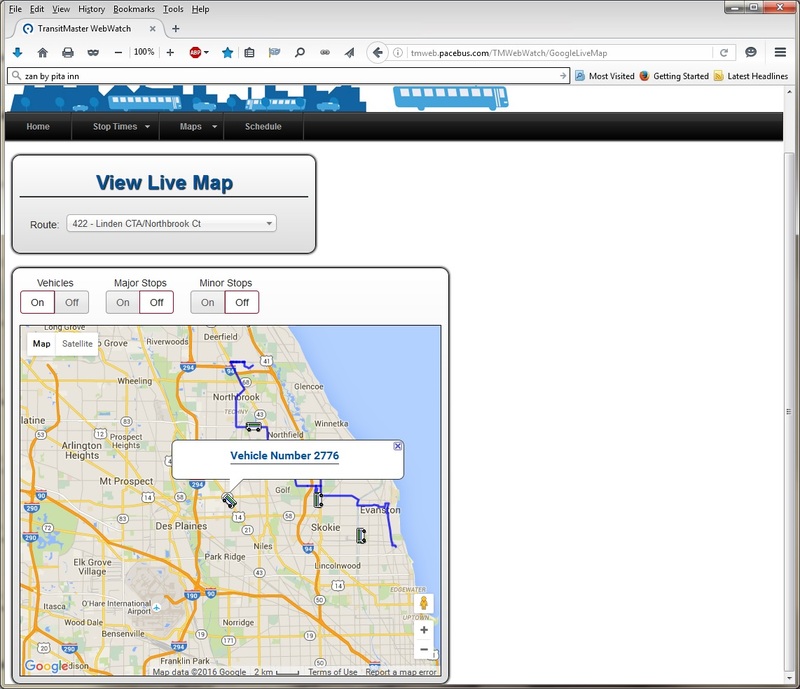 The last WB 422 leaves Linden at 8 PM and gets to Northbrook Court at 9:23 PM. The bus then goes to Golf Mill and turns into a 270 that leaves Golf Mill at 10:20 PM and arrives at Jefferson Park at 10:44 PM. It leaves Jefferson Park at 10:50 PM and arrives at Golf Mill at 11:14 PM. FINALLY, some recognition by Pace that the destination signs were messed up. Per the notice, the terminal will be the food court, but the bus will stop at Penney's. No, it turns out I was right. The bus from Linden is usually an Axess, as it is tonight. The bus at Golf Mill is usually an EZ Rider. Webwatch simultaneously shows 2776 heading north on Milwaukee. It was previously on 422; I saw it physically SB at Shermer and Willow today at about 4:00 p.m. and then going back NB (Glenview and Waukegan) at 6:00. It must go out of service at Linden about 7:40. From what I described above, they changed the signs to 410 Niles Free Bus/410 Golf Mill and 410 Niles Free Bus/410 Village Xing. Looks like "East" is no longer essential. Pace 2641 operated by Niles Free Bus has been wrapped once again as the Holly Trolley. Here is a picture of it taken at Golf Mill today. Here is a picture of it taken at Golf Mill today. They even put up the correct sign before hitting the food court entrance. Based on past performance, that's unbelievable. However, as usual for a Pace wrap, it's too busy. I suppose that the people walking behind the front wheel are heading to Auntie Anne's Pretzels or some cell phone kiosk in Golf Mill. I must have missed (but saw it driving by today), that in Nov. 2016, 410 was rerouted via Oakton and Milwaukee so that it now does stop in front of Jerry's, although SB on the west side of the street (map). ... I do remember the buses that the buses were right by the JCPenney entrance, don't know if that's still the case. There are 2 bus shelters south of and perpendicular to J.C. Penny, where the big buses stop and where a Pulse station is to be built. As noted above in this topic,the Niles Free Bus generally circulated around Golf Mill, but had its official terminal at the west side door of Penny's. After the sign snafu, the official terminal was made the food court, but it still stops at Penny's. Since it appears that the merchants indirectly pay for the bus (either to the village, or through generating sales taxes), that isn't going to change. The 3 stops are shown as blue dots on this Google Map. Passenger notice that they are messing with Route 410 again, presumably to not serve some townhouse loop. Fortunately for someone I used to know who commented here about the bus, she's at Washington and Lyons. Niles Free Bus appears to be re-branding their bus fleet. I saw a number of their buses at Golf Mill today in this new scheme as shown on 2646. Since 2640-9 were delivered with the Niles Free Bus decals, was it lumpy under the wrap? Update: It looks like they changed the signs again. I'll have to check it out, but for reasons related to Mel's, it won't be at Golf Mill. I stopped at Golf Mill briefly. 2644 was wrapped; 2647 was not. And, yes, the wrap was VERY lumpy. The via was "Lyons/Library." "H" trips only signs were up, but the 410 signs on Foster still were, too. Slightly related, there were various 240 trips bus stop signs on Golf and Central Rd.Update: Explanation is that schedule is posted stops only. Niles has wrapped bus 2641 as the Holly Trolley again this year. Sort of French impressionism, but like most of these wraps, too busy. Yesterday at Golf Mill, I noted that 2649 had a Ventra reader and a metal fare box. I wonder if something is up. Neither's the case (at least in the immediate future). There was a hearing a couple of years ago to charge a quarter, but nothing happened, the routes were restructured, and the buses have new wraps still saying "Niles Free Bus." Even if they were going elsewhere. the Niles Free Bus decals would have to be stripped from all except 2601. They weren't GenFare boxes, so it couldn't be going to a division. There might be something in connection with Pulse, but nothing was mentioned in the Pulse hearing notice. Bus 2641 has again this year been wrapped as the Niles Free Bus Holly Trolley.